Gina Laurenzi graduated from the University of WI – Milwaukee (UWM) with a BFA in Dance – Choreography & Performance. 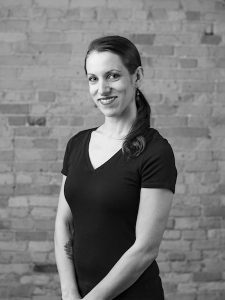 Currently Ms. Laurenzi serves as the Artistic Manager for Danceworks Youth Performance Company (DYPC), is a guest choreographer for the Makaroff Youth Ballet (Appleton, WI), an associate lecturer at UWM, and creator of the Gina Laurenzi Dance Project. Before beginning her chapter in Milwaukee, Ms. Laurenzi performed with Giordano II, Inaside Chicago Dance, and in Dances from the Hall and Dance Chicago. For seven years, Ms. Laurenzi owned and operated Laurenzi Dance, a studio and center for dance performance companies in her hometown of Kenosha, WI. During that time, Ms. Laurenzi began attending UWM and getting to know the Milwaukee dance community. Balancing a studio, school, and a performance career was becoming a difficult task so eventually Laurenzi made plans to move to Milwaukee to fully immerse herself in the Milwaukee arts scene. In 2012, Gina was a movement researcher under Simone Ferro assisting in the creation of her work for the UWM, Milwaukee Ballet and Present Music collaboration, “Falling”. In 2014, Gina worked with Maria Gillespie in the formation of “Toward a Center of Two Things”. Gina has performed in Gillespie’s Hyperlocal, Luc Vanier’s Somatophobia, Rooftop Dances, and in the work of UWM alum, Kym MacDaniel and Madeleine Schoch. Most recently, she has had the experience working with artists such as Dani Kuepper, Daniel Burkholder and Dawn Springer as a member of Danceworks Performance Company. Laurenzi’s work has been shown in Italy, Prague, and many art venues across Wisconsin including; the University of Wisconsin – Parkside, Next Act Theatre, Danceworks Studio Theater and in the Milwaukee Fringe Festival alongside Danceworks colleague, and friend, Christal Wagner in their collaborative event, Two 2 Duet. After taking a year off from performing, Ms. Laurenzi is excited to get back in rehearsal with Danceworks Performance Company next season in addition to pursuing her Yoga Teacher Training at Healium Hot Yoga. More than anything, Gina loves creating dances with and for the artists of tomorrow and has the privilege of working with so many wonderful young people on a daily basis. Gina’s ideal day is one that has time for choreographing sweet moves for DYPC, playing with her three kooky cats, and thinking about her next travel adventure! View Ms. Laurenzi’s current teaching schedule here.